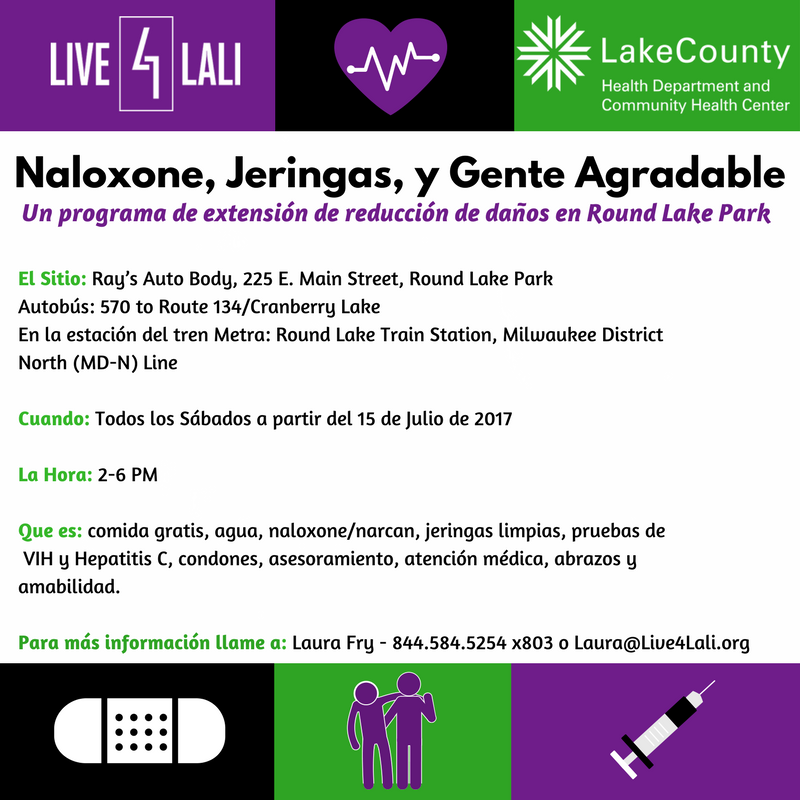 In an effort to reduce overdose deaths, HIV and Hepatitis C transmissions, and barriers to treatment, Live4Lali and the Lake County Health Department are teaming up to offer a new local strategy. Motivated by the devastating impacts of the growing opioid epidemic, a team of public health educators, physicians and medical professionals, social workers, and impacted advocates will provide free harm reduction services weekly at our Round Lake Park site. None of this could have been done without the support, guidance and generous donations provided by Chicago Recovery Alliance (CRA), Harm Reduction Coalition (HRC), the Lake County Health Department, Maya Doe-Simkins, Dr. Beth Dunlap, Ray’s Auto Body, and Chief George Filenko of the Round Lake Park Police Department. Without these community partners this would only have been an idea! In 2015, IDPH reported a 200% increase in Hepatitis C prevalence among 15-29 year olds, and a rate of 38 HIV disease diagnoses per every 100,00 people with 42% of new cases affecting people under age 30. 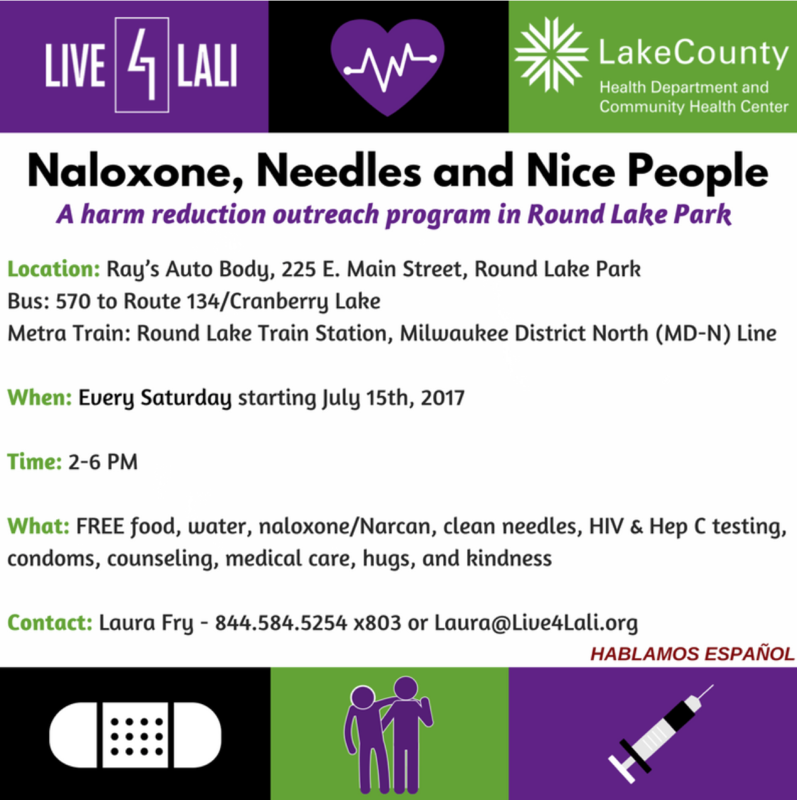 For information about accessing Live4Lali’s harm reduction services contact Laura Fry at [email protected] or 844.584.5254 x803.